Emerson lodged at his grandparents’ home, the Old Manse, when he first moved to Concord. Ralph Waldo Emerson moved to Concord, Massachusetts, in 1834 to begin a new life. His young wife had died. He had resigned from the Second Church in Boston. He was struggling to maintain his health, and he had begun his career as a public speaker. He wanted to leave Boston, and Concord was the home of his ancestors. One, Peter Bulkeley, had been a founder in 1635 and served as the town’s first minister. Another, his grandfather the Reverend William Emerson, was a minister during the Revolutionary War and had probably witnessed the April 19, 1775 battle at the North Bridge. As a boy, Emerson and his brothers stayed with their grandparents at their home, which was known as the Old Manse (a Scottish term for parsonage). When Emerson first moved to Concord, it was to take up lodgings in the south gable of this family home. For most of his first two years there, “Aunt Mary” was boarding nearby. Concord was quiet and peaceful, which suited the demeanor of this calm man. It was sufficiently remote, yet near enough to Boston to conduct his business, especially when the railroad arrived in 1844. He was attracted by the “lukewarm milky dog-days of common village life.” Concord had a population of 2,021, including twenty-eight free persons of color. Its main industries were agriculture and the manufacture of cotton, metal, and wood products. The rural beauty of the town with its rivers, marshes, and wildlife, called to Emerson as well. Here, at the Old Manse, Emerson committed to paper the work he had been contemplating for a few years. The book was Nature, and it would launch his literary career and intense study and expression of Transcendentalism. 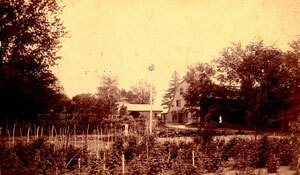 The rural beauty and common village life appealed to Emerson. In 1835, when Emerson married Lydia Jackson, he purchased the house on the Cambridge Turnpike they called “Bush.” It would be his home for the rest of his life. Emerson was active in town affairs, serving as a member of the school committee, library committee, and volunteer fire department. He attended town meetings, spoke regularly at the Concord Lyceum, and gave the keynote address at the 1835 anniversary celebration of the battle of 1775. In 1837, his Concord Hymn, written at the request of the town, was sung at the dedication of the Battle Monument near the site of the North Bridge. Emerson was a member of the “Walden Pond Society” and also attended the (Unitarian) First Parish Church whose minister, the Reverend Dr. Ripley, was his step-grandfather. Emerson was a much beloved citizen of Concord.